We heard some interesting details about Project Spartan at the Windows 10 event last week. 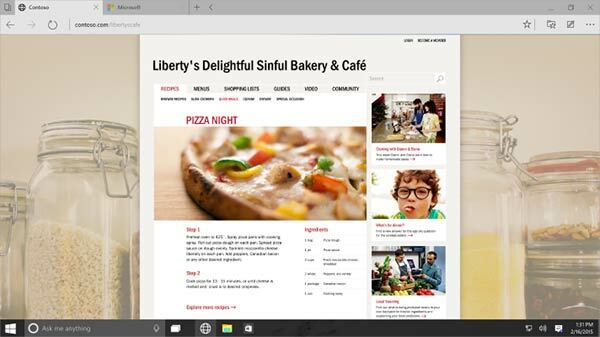 The key features of the new browser are to be; speed, backwards compatibility via the IE11 engine on older sites, universal presence across Microsoft Windows 10 devices, Cortana integration, the ability to ink/annotate on web pages and having dynamic updates via the Store. But what will it be called? While even the latest version of the Windows 10 preview for Insiders doesn't include Project Spartan it has been discovered that you can run IE11 with the new Edge document rendering mode – like Spartan. The new mode is enabled by setting a flag, via the IE11 task bar, to 'Enable Experimental Web Platform Features'. Anandtech decided to test the performance of this new mode, which should give a good indication of the speed of Project Spartan when it becomes available. Please find the results table below. 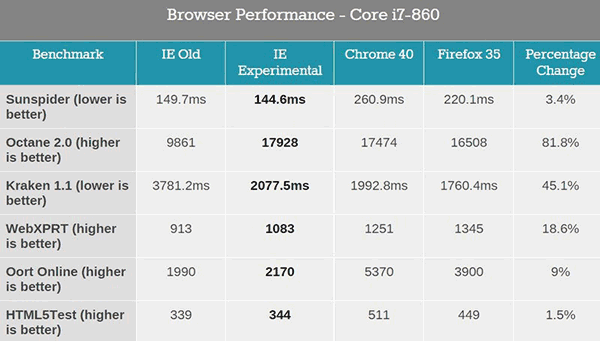 You can see some great performance numbers from the new browser which are highly competitive with the likes of Chrome and Firefox and represent an impressive gain compared to IE (per cent improvement shown in last column). Of course with Project Spartan as experimental software in an early testing phase there should be plenty of room for improvement in both speed and compatibility before the software hits v1.0. Evo - I think that'd be what everyone would abbreviate Evolution to anyway, and although I like it, I suspect they'd rather avoid Echelon because of potential snooping connotations. Also (in general) how many of these would be ruled out because of existing trademark issues - if they can't use a name worldwide, they'd probably rather pick something else. That aside.